This story is about a house. Jennie Reed’s house. “I love that about the house,” she said. She’s been living in her Delaware County home for almost a year. She’s a retired teacher of 31 years who loves history and now lives in it. “They wanted to be free so bad they were willing to put their own lives at risk,” she said. 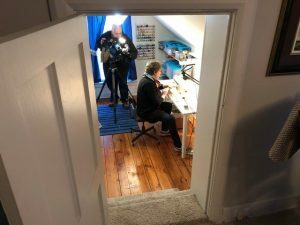 This room in the upstairs of her home is her crafts room. It used to be a secret room that gave shelter to runaway slaves on the Underground Railroad during the Civil War. She says she feels the history in the house. She says they are good spirits from people who were afraid and are now free. The room, she says, didn’t used to have a door or window attached to it. Essentially, it was a secret room that was accessed from the basement. Across town, it’s a different house with the same story. 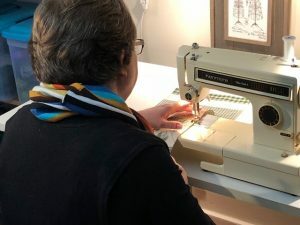 Donna Meyer, the executive director of the Delaware County Historical Society, says The Meeker Homestead also likely housed runaway slaves both in the attic and the basement. She says in Delaware County there were at least 30 Underground Railroad havens. In the state of Ohio, she says there are more than 300. Reed calls these havens valuable lessons we can all learn from. “When we’re scared, we need to have the courage to move through things and have faith that we’re going to make it,” she said. Wednesday night, the Delaware County Historical Society hosted “Homes in Delaware County on the Underground Railroad,” which was a free event open to the public that featured homes that can still be seen that were active “stations” during the period of 1800 through 1863. To learn more about the organization, click here. The Delaware County Historical Society, as part of it’s mission to preserve and promote Delaware County history, has compiled and catalogued the Underground Railroad house known to be in the county. This is an on-going project. We encourage residents to bring houses to our attention. The society has created a Self-Guided Driving Tour of the known Underground Railroad Homes that still exist in Delaware County. The document of the driving tour that features these homes is available at the Cryder Library. The driving tour document is also available for download at the DCHS website on our History Walks And Tours page.